Chocolate Kahlua Hot Fudge (make ahead of time) or any store bought hot fudge sauce. In a blender add flour, milk, cocoa powder, powdered sugar, eggs and oil until smooth. 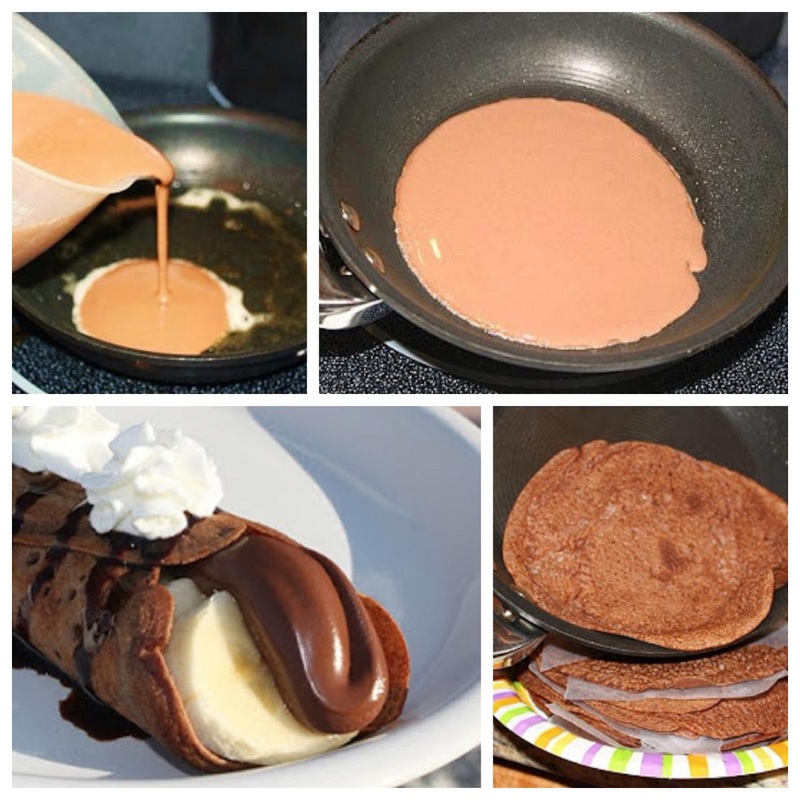 Heat a large nonstick pan and grease with cooking spray for each crepe made. Pour 1/4 cup crepe mixture into pan, immediately the pan so that the batter spreads out thin into a large circle. Cook for 1 to 2 minutes or until bottom of crepe is light golden brown. Flip, cook 30 seconds to 1 minute or until light golden brown. Continue making all remaining batter the same. Stack these with wax paper in between until ready to use. They freeze perfectly as well. To serve on a flat open crepe, place slices of banana on crepe, spoon nutella from one end of the crepe to the other, add whipped cream to the top of each crepe. Fold or roll from each edge of crepe over filling. Drizzle with Chocolate Hot Kahlua Fudge Sauce and optional chopped hazelnuts. wow What a droolworth pancakes! The sauce is the keeper! OMG... not sure what else to say! All belongs to me! Claudia, you just made me fall out of my chair. Oh my goodness! This is one perfect crepe, love the kahlua fudge sauce. Oh,I'd sing for my supper if you'd serve me this! Mouth-wateringly delicious! Wow, these are the most decadent crepes! And that Kahlua Fudge Sauce sounds fabulous!!! I just showed this to my husband & he totally just drooled! He loves nutella & crepes so this is a double win! OMG my sweet tooth has exploded….speechless...!! Sinfully delicious! The chocolate crepes and your kahlua fudge sauce are brilliant! OMG Claudia!! You knocked it out of the park with these, they look scrumptious! YUMMMM! Okay, this dish is just too pretty to eat. You've really done a great job with these dessert ingredients! Did someone mention Kahlua. Could it be a bottle accidentally forgotten by my Hubby and found at the curb of the Miami cruise port? LOL Yes, believe or not he did actually forget a box of 4 amazing selections. Imagine the lucky bugger who got their hands on that treasure! The description is enough to get you excited about this dessert, but then when you SEE it...oh my! wow, look at all that chocolate! quite delicious looking! OMG Claudia...you are killing me with this one! I think I gained 5 pounds just reading this post. These look amazing. Nice, Claudia! I love banana anything with chocolate and nuts. Nutella provides almost all of this;) I need to make crepes tomorrow morning! Oh my word...scrumptious- absolutely scrumptious! Thank you for sharing, my daughter is a big fan of crepes. She'll flip for these! These look so heavenly! I would have no problem eating them all day long! Kahlua and Nutella, this would be what she calls gilding the lily. Any other ideas for you Kahlua Sauce? BTW, I think I will post about this at my blog, I love to talk about Nutella. Oh I can't even look at this without getting fat...I love it! Oh Claudia, you are sending me straight to the kitchen to eat a jar of Nutella with some bananas right now . . . just from looking at the pictures alone! What a winning recipe! What could you use in place of the Nutella? We have a serious tree nut allergy in our house. OMG, just look at those melting chocolate sauce. This is a killer! Yumm.... Thanks alot.